Marian — Piano. Push. Play. For this project, Michael wanted to explore surface textures and applying a façade to an architectural object. 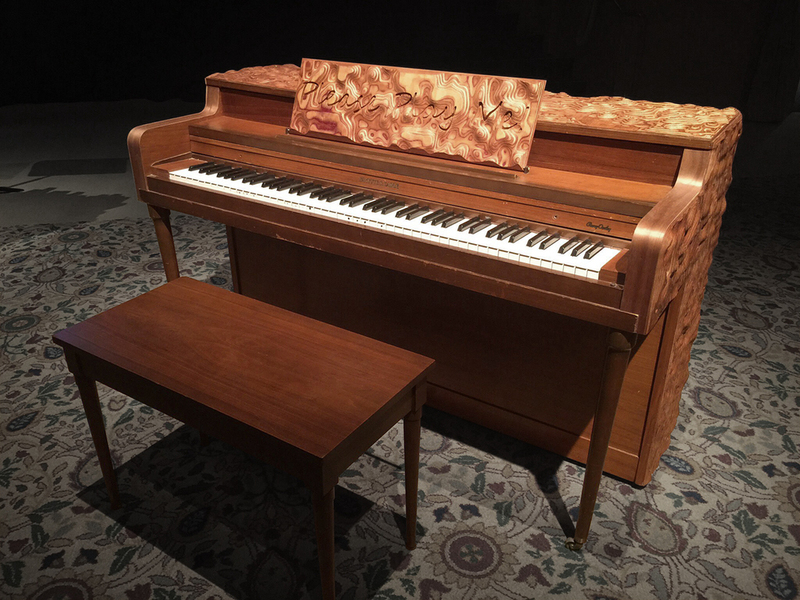 This texture not only explores the possibilities of a pianos appearance, but reflects a visual representation of the feelings music can bring into a person's life. The texture embodies the piano, wrapping seamlessly across its typically flat planes, exposing the many layers of the material, just as the listener might when dissecting music. Similar to a composer writing unique melodies to be played on specific instruments, Michael generates code based on CAD geometry intended to be performed by a computer numerically controlled router, turning digital forms into tangible objects. Michael Erspamer is a designer and digital fabricator working at a small custom furniture shop in downtown Portland. He has an extensive background in cad modeling and metalsmithing, blending new age digital craft with traditional techniques. Margaret Marian McPartland, OBE (née Turner; 20 March 1918 – 20 August 2013), was an English-American jazz pianist, composer and writer. She was the host of Marian McPartland's Piano Jazz on National Public Radiofrom 1978 to 2011. After her marriage to trumpeter Jimmy McPartland in February 1945, she resided in the United States when not traveling throughout the world to perform. In 1969 she founded Halcyon Records, a recording company that produced albums for ten years. In 2000 she was named a National Endowment for the Arts Jazz Master. In 2004 she was given a Grammy Award for lifetime achievement. In 2007 she was inducted into the National Radio Hall of Fame. Although known mostly for jazz, she composed other types of music as well, performing her own symphonic work A Portrait of Rachel Carson with the University of South Carolina Symphony Orchestra in 2007. In 2010 she was named a member of the Order of the British Empire.